As we see, fiber optic transmission has already been the efficient way to transmit a wireless signal and RF signal. Compared to coaxial cable, fiber optic cables has the advantages such as lower signal loss and lower weight, except this, it is also cheaper than coaxial cable. Only by these reasons, fiber optics play an important role in wireless networks. Next we will introduce several fiber optic product in different application for you. The function of fiber optic transmitter, optical transmitter with AWG see at the figure, is transmitting the RF signal into an optical signal in 1.3μm, the input impedance of the fiber optic transmitter is 50Ω and the output is an optical signal whose brightness is synchronized with the RF voltage. 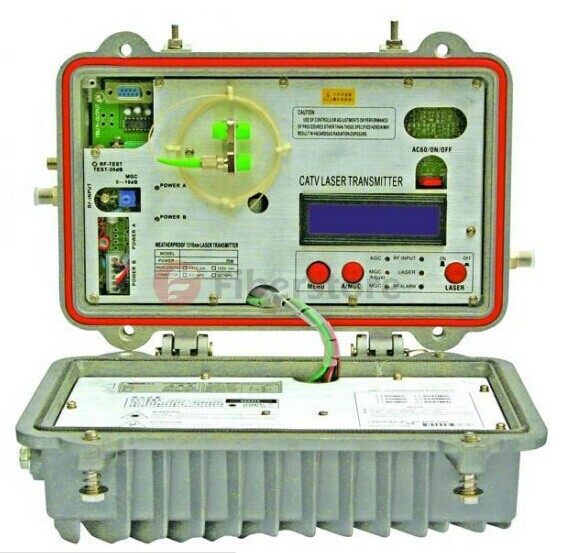 An optical detector internal to the laser transmitter is used to monitor the output power and adjust the bias current of the laser to maintain a constant average optical output. It maintains the consistency in performance, the best linearity and the longest life of the system. Fiber optic receiver use a high speed detector and for transmitting the optical signal to RF signal. It is usually used with fiber optic transmitter. Low noise linear gain stages boost the signal back up to the desired RF level. Our Fiberstore‘s all fiber optic receivers overtake consistent tests and keep stable and long-term performances. Well, based on the special characteristic of RF in fiber optic applications, single mode fiber cable is the choice for it. The fiber has a core and cladding size of 9/125μm, and the fiber optic connector mainly for the stability and coupling of the light. 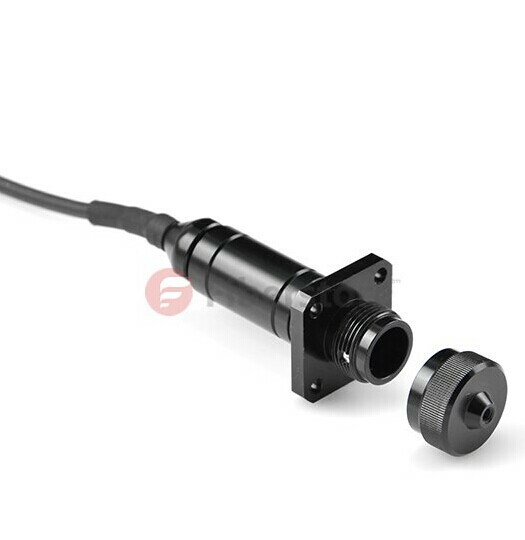 But in the RF/fiber optic system, angle polished connectors are used more often, such as APC, UPC. Due to them, they can reduce the optical reflections at the connector. At the same time, we need to know that reflection in the system can cause increased noise, dirt and so on, then the connector will cause higher connector loss but also reflections. So the connector need to keep clean, the right way to keep clean is that using 99% alcohol and lint free wipes, always replace the cap on the ferrule when the connector is not in use. In Building public safety, Fiberstore’s technology and Bidi fiber optic transceiver deliver the signal across the fiber optic network for in-building signal distribution. The benefits of fiber optics are endless. Fiberstore’s modular devices transmit RF signal in fiber easily and they keep distortion-free communications in the building of emergency, fire and police radio RF systems. Facing with the system capacity and improving the reliability of the network. Fiberstore is toward the direction of lower telecommunication cost, safe and reliable for users. In military aspect, Today’s global battlefields are sophisticated networks of Army, Navy, Coast Guard and Air Force defense organizations requiring robust, they need monitoring and tracking, as well as high quality voice, video and data communications, as for this requirements, Fiberstore RF solution unmatched performance for radio frequency transport applications ranging from low frequency through VHF, UHF to satellite-band transmissions. Fiber optic cables provide the highest performances for soldier’s safety in military applications. The figure shows the special connector that can be used in the military application. We are very strict with the design and quality of fiber optic connector. With the developments of the Internet, wireless LAN technology and protocols such as IEEE 802.11, Fiberstore;s fiber optic transceiver technology provides flexibility in architecture design, extended radio frequency coverage and enhanced performance in the wireless spectrum, and provide higher ability for wireless users. Fiberstore is doing his best for faster and more reliable communications solutions. This entry was posted in Network Solutions and tagged fiber optic equipment, fiber optic network, fiber optic transmission on February 10, 2015 by Admin. Therefore, our research target to develop the Smart IDC fiber optic solution to solve the current problems of IDC network with the 3 IDC network control technologies of the Cloud-Optimized Virtual Network Control technology, the Flattened IDC Network Control Technology and Auto-managed IDC network control technology. technology, SDM (space division multiplexing) technology is seriously explored to harness the traffic in economic and energy efficient way. This entry was posted in Network Solutions, Wiki and tagged EPON system, fiber optic network on July 25, 2013 by Admin. This entry was posted in Fiber Optic Transmission and tagged fiber optic network, fiber optic transmission, PDH Multiplexer on June 21, 2013 by Admin. Polish fiber optic network operator INEA SA says it has received a strategic investment from an affiliate of Warburg Pincus, a global private equity firm focused on growth investing. The investment firm has committed additional funding for growth and consolidation, including planned roll out of fiber to the home (FTTH patch cable) technology. Terms of the investment were not disclosed. Since its foundation in 1992, INEA has grown into the fourth-largest fiber optic network operator in Poland and claims it is the leading triple-play operator in the Wielkopolska region. Passing 360,000 homes and serving 170,000 subscribers, INEA provides telecommunications services over its fully upgraded network, including HotSpots throughout Poznan and its own local TV channel. Wielkopolska is the third-largest Polish province with a population of 3.4 million. In 2012 the dompany generated revenues of PLN 169 million ($53 million). The FTTH roll out will extend fiber-optic broadband access to over 200,000 additional households and a significant number of businesses in Wielkopolska. INEA says its fiber optic network will be the most advanced in Poland, providing high-speed broadband access to over 500,000 homes across the entire Wielkopolska region. In addition, the investment by Warburg Pincus will support INEA’s ability to consolidate the highly fragmented local cable market. The transaction is believed to be the largest private equity investment in Poland this year. This entry was posted in Network Solutions and tagged fiber optic network, FTTH patch cable on April 27, 2013 by Admin. Japanese communication fiber optic network company So – net announced yesterday that they have introduced the world’s highest speed fiber optic networks “NURO optic”, as “one of the world’s fastest” personal commercial fiber-to-the-home cable service, faster than Google Fiber. Its the biggest 2 GBPS download speed, upload speed is 1 GBPS, and supports a maximum speed of 450 MBPS wireless base stations. To deal with “NURO optic” now is to sign up for two years, monthly 4980 yen, at the same time you need to pay 840 yen fees and 31500 yen for installation cost. But “NURO optic” service has not been extended to all of cities in Japan, only open the Tokyo and the Kanto and other four cities. So-Net was established in 1995 in November, and in the next year began to provide fiber optic network services. In 2001, So-Net began to arrive in Taiwan. So-Net Hong Kong is in 2001 to provide broadband Internet access services and with the SONY brand and premium strategy called preemption already saturated cable management Internet users. In May 2002, cooperate in central Tokyo electric power, electric power company, started to provide fiber-optic Internet service. (In early August last year, SONY announced that it plan to spend 60 billion yen ($764 million) to buy a 42% stake, the rest of the implementation of the company’s sole holding. SONY plans to use the So-Net to enhance Japan and the Asian companies and interactive entertainment experience, and hopes to provide new web fiber optic transmission services project.). This entry was posted in Network Solutions and tagged fiber optic network, fiber optic transmission, fiber-to-the-home cable on April 17, 2013 by Admin.